A few weeks ago, my hubby decided that he wanted to surprise me by taking me somewhere fun. Unfortunately, he’s not that great at covering his tracks. No, I didn’t go snooping around. The man called me into his office to show me something on his computer and lo and behold! He had actually left the printed tickets to see Scientist Turned Comedian: Tim Lee (AKA the YouTube Comedian or PowerPoint Comedian) right on his desk in plain sight. But don’t worry – I was still surprised to discover that there was such a thing as a scientist turned comedian. Who knew? As a chick who has probably only made one science-related joke in her entire lifetime, I wasn’t sure how the show was going to be. (Just in case you were curious, the joke occurred at the end of my 7th grade presentation on the Periodic element Barium. I warned my captive audience to never allow their loved ones to ingest a water-soluable barium compound of or else “you might have to BARIUM!” Get it? See what I did there? Sounds like bury ’em? Yeah, it was pretty lame). As I was saying, I was experiencing a little bit of concern with regards to whether or not I was actually going to “get” this Tim Lee guy’s jokes or not. I’ve always fared better with the creative/artistic side of my brain as opposed to the logical side (a Vulcan, I am not). Fortunately, I had nothing to worry about. 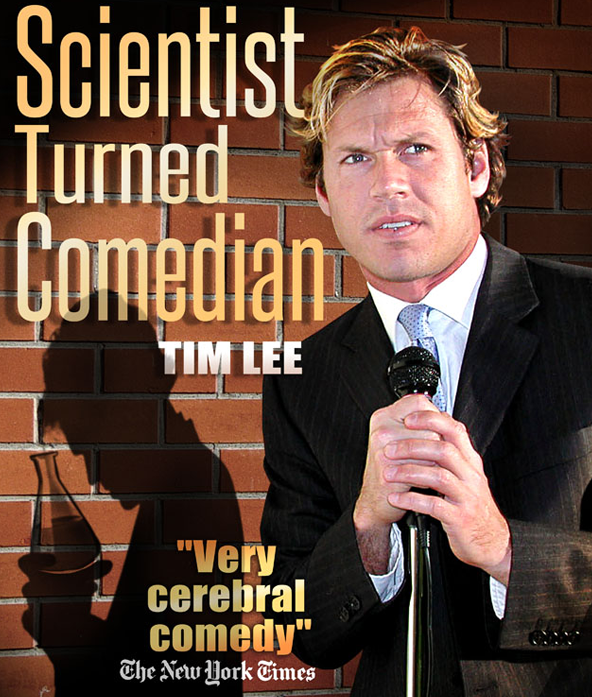 The whole beauty of Tim Lee’s comedy act is that it’s set up to make sure that even the scientifically-challenged folks like me can understand what’s going on. 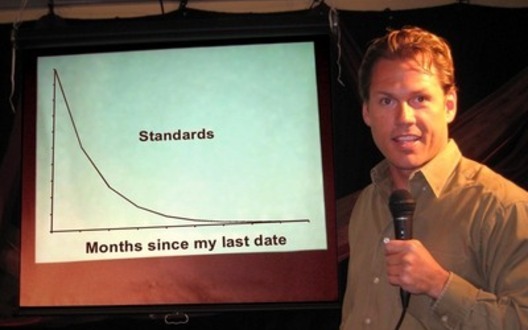 By utilizing a PowerPoint presentation, Tim Lee is able to do a quick “lesson” on various scientific concepts and theories before comparing them to real-world situations. In other words, a quick “mini lecture” becomes the set-up for (very) humorous observations. Think Jerry Seinfeld with a PhD. I think one of the things that I really enjoyed about the comedy show is that Tim Lee never actually acknowledges it as a comedy show. According to him, his audience members have all bought tickets to a science “seminar”. Amongst his PowerPoint slides you may come across some “embarrassing” photos of Tim partying with a couple of blonds. The “flustered” scientist apologizes and moves forward with his “lecture”. It’s all very smart, very nerdy, and very fun. Oh, and did I mention cheap? Tim Lee has several upcoming shows, but if you buy tickets for this Friday the 22nd at Acme Comedy in Hollywood, you can take advantage of the half off Goldstar discount here. Duh, winning! You can check out some video clips of Tim Lee’s style here.